Soyabean meal is produced by multistage extraction of oil. It is a good source of proteins and free from cholesterol. Soyabean meal is produced by multistage extraction of oil. It is a good source of proteins and free from cholesterol. Soya meal contains enough amino acids that meet the biological requirement of metabolism. It is an economical and abundant source of protein and minerals. Soyabean meal is used mainly for animal feed and other products requiring high protein. We offers high grade de-oiled soya cake, which is superior in its nutritional value. 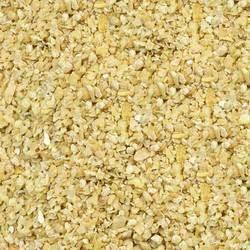 Our Soybean Meal is hygienically packed and available at reasonable rates. Soyabean Meal is widely available, highly palatable, and rich in essential amino acids. Highly digestible for swine and poultry, the amino acids in soybean meal complement other ingredients to create a balanced diet. Because it's an excellent source of rumen degradable protein, soybean meal allows microbes to produce maximum levels of high-quality microbial protein. A good source of amino acids, soybean meal also functions as a widely accepted alternative to fishmeal in aquaculture diets.